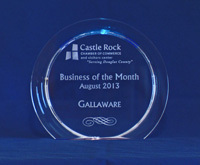 Gallaware was thrilled to be the recipient of the Castle Rock Chamber's Business of the Month award for August 2013. A member since 1999, Gallaware is proud to be a part of an organization that supports it's community and local businesses as much and as well as the Castle Rock Chamber does. The Chamber has made it easy and fun for Gallaware to be actively involved in local community events such as the ArtFest, WineFest, Business After Hours, Fair, Parade and Rodeo, etc. Thank You! Castle Rock Chamber for the honor! "Congratulations from the Castle Rock Chamber for being recognized as an outstanding business." See the related article on pg 10 of the Castle Rock Chamber's September 2013 Business Voice Magazine (6.6M). Gallaware recently offered its services to assist the Castle Rock Chamber and its Ambassadors with a better way to manage their monthly points system. Primarily implemented as a way for the Chamber to track and acknowledge the contributions and volunteer work of the Ambassadors, the old spreadsheet and paper-based point system was becoming time consuming and cumbersome to keep up, and even more difficult to generate consolidated informative reports from. As part of the new 2013 Executive Committee, Ambassador Secretary, Melanie Calhoun, with RE/MAX Alliance - The Calhoun Team, approached Gallaware "to see if there was an easier and more efficient way to do this". Ms. Calhoun was familiar with Gallaware’s "productivity software development" and their ability to create easy-to-use-and-maintain custom solutions for a wide range of data management problems. Gallaware quickly determined the best solution for this problem was a web-based, database application or webapp. 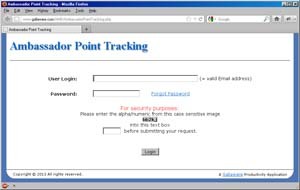 Each month, as part of the secretary’s responsibilities, Ms. Calhoun logs into the Ambassadors point tracking system (AMB) website and enters information on all of the events that the Ambassadors might participate in during that month. (For those not aware of the Chamber’s Ambassador program, there are a LOT of things that the Ambassadors do. A short list includes: making Anniversary Calls, attending, working at and sometimes speaking at Ribbon Cuttings, Business After Hours, Business Over Breakfast, Business of the Month, serving as "Buddy" for a potential or new Chamber member at one of those functions, Mentoring new Chamber members, and much more.) Assigning Ambassadors to events through AMB is more efficient than the previous routine of copying and pasting data into spreadsheets. Ambassadors can then log into AMB at their convenience and essentially "check" each event they participated in. They no longer have to remember how many points are earned for each (type of) activity, nor calculate the total points earned that month; the system does this for them. This feature ensures more accurate point calculations. The webapp provides a variety of reports that can be generated with a few clicks of the mouse, such as individual monthly point sheets for each Ambassador, a consolidated summary of all Ambassadors points for a given month (to instantly determine Ambassador of the Month), historical information to make sure no Anniversary Calls or Mentorings fall through the cracks, etc. These reports provide information in a manner that was very difficult with the previous spreadsheet and paper system. AMB even has the ability to allow the Ambassadors to enter comments based on their activities and membership interactions and automatically forward these comments via email to the Chamber for any necessary action. Although already exceeding the capabilities of their previous method of point tracking, the list of potential capabilities for this new application continues to grow. Gallaware has really enjoyed assisting with this project and appreciates the opportunity the Castle Rock Chamber, it's Ambassadors and especially Ms. Calhoun provided to help demonstrate it's services and capabilities. See the original article on pg 16 of the Castle Rock Chamber's June 2013 Business Voice Magazine (6.7M).